It’s hard to believe that 2018 is almost over but it is! We’re in the final month of 2018 which prompts all of us to not only reflect on the past year but to look ahead to the new one on the horizon. For us, here at Alaska Air Forwarding, a big part of looking ahead is anticipating the fishing season for the coming year. Fishing is one of the primary industries in Alaska and has experienced a significant rebound since 2016. In fact, according to the latest Labor and Workforce Development, the industry grew 8.3% in 2017. While this industry experiences its share of highs and lows, overall, it remains a constant in Alaska’s economy. Every January marks the beginning of a new fishing season when Pacific Cod fishing begins and runs through most of the calendar year. 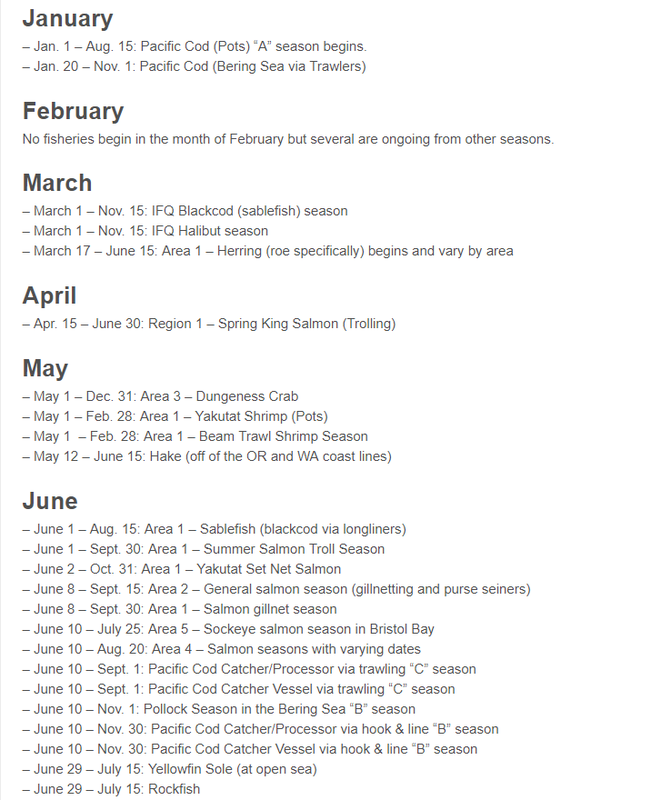 Almost every month, with the exception of February and July, marks a new season for a specific type of fish in a specific area of Alaska. 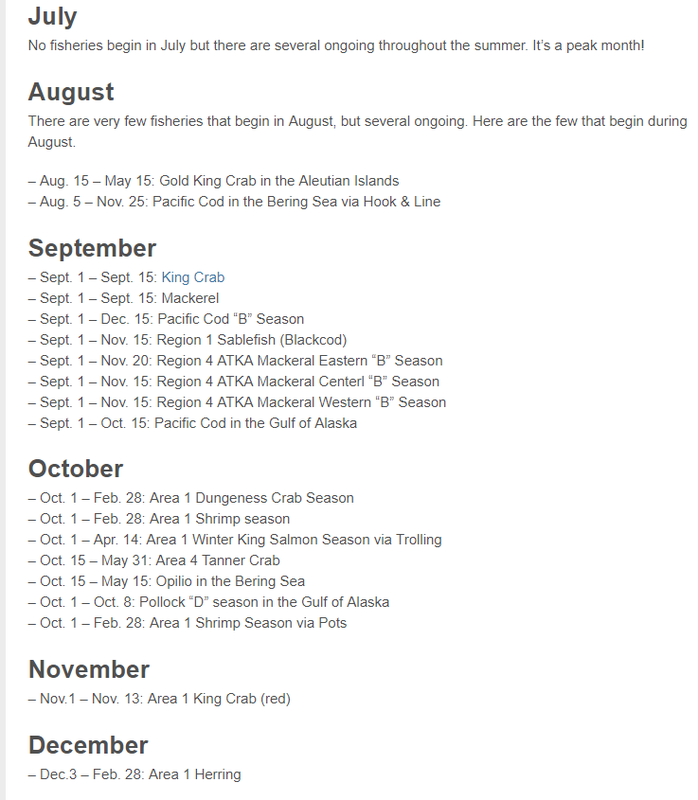 Below is a calendar of how the season unfolds month by month with their respective regions listed. While 2017 proved to be a great year for the industry, 2018 was not quite as strong for each region. For example the Gulf of Alaska had a rough year for Salmon, while Bristol Bay had a strong harvest according to a 2018 Trends Report released by Labor and Workforce Development. One change that the industry saw in 2018, was the implementation of electronic monitoring on the boats by the North Pacific Management Council. In a recent article published in Alaska Journal of Commerce, small electronic devices, resembling cameras, were placed on 145 vessels and monitored the total catch of the vessel. In the past, human observers have been on these vessels monitoring their catch. However, the electronic monitoring proved to be equally effective in 2018, especially on smaller vessels where adding an additional human observer is a challenge. At this point, the plan is to continue this electronic monitoring and if funding is available, will increase the number of vessels monitored in this way. It’s expected going forward, that a combination of electronic and human observers will continue to monitor the vessels which is key to managing the supply and predicting the seasons ahead. Here at Alaska Air Forwarding, we also monitor this industry that we have closely supported since our beginning and are always ready to provide support for any changes the industry may experience.